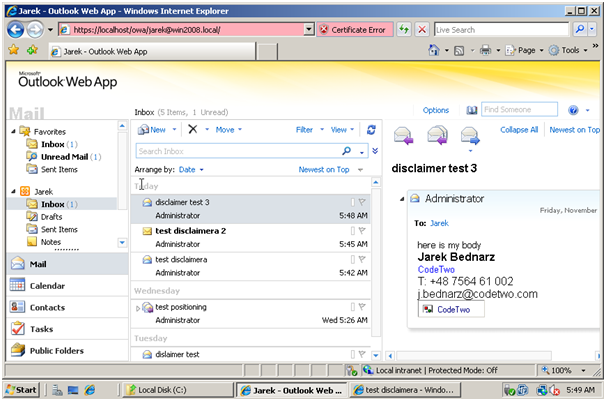 The emergence of Exchange Server 2010 triggered a round of tests of the disclaimer system built in to this server by Microsoft. We were simply curious if the feature allowing the management disclaimers in the new Exchange is a major step forward in comparison to its predecessor. Our findings are that the users of Exchange 2010 who want to have really professional email signatures and disclaimers will still need to rely on 3rd party tools, such as CodeTwo Exchange Rules 2010. The test proved there has been little progress in this respect in the new Exchange Server 2010 as it turns out the new server lacks even the basic features our solution has boasted for quite a while, let alone those more advanced ones. Although it now supports HTML and Active Directory fields, it does not include even a very simple disclaimer builder. You will not be able either to insert the footer in selected places in the message, such as below the most recent response. We were unable to make the program add the company logo, but we believe it would have happened if we had kept on trying. But the software should not be that complicated. 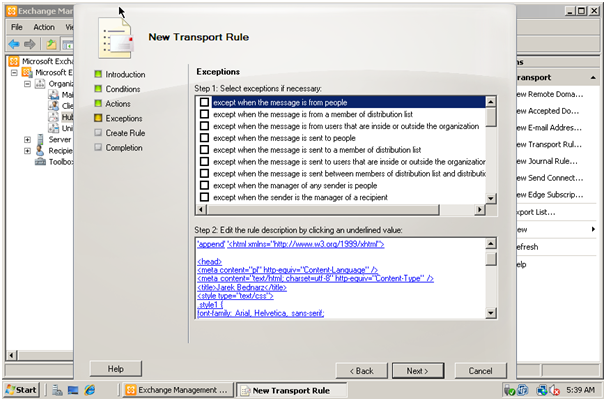 For those of you who have already upgraded to Exchange Server 2010 and look for a solution that will take care of the signatures and disclaimers, we have published the release version of CodeTwo Exchange Rules 2010. 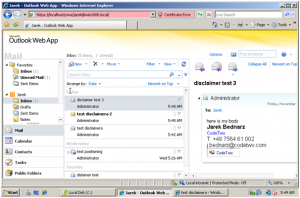 Read below the whole story describing our first test with the built-in disclaimers system in Exchange 2010. Here is a brief overview of the system. 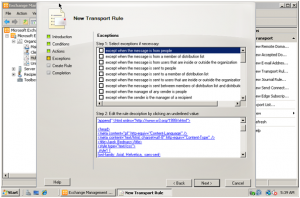 The way in which you define rules that will add disclaimers to email in 2010 has not been modified since Exchange Server 2007. 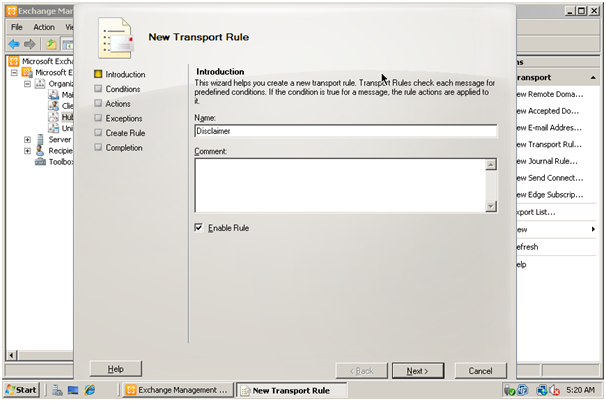 You start by opening the Transport Rules tab and creating a New Transport Rule. Next, we define the conditions for the rule to be used. 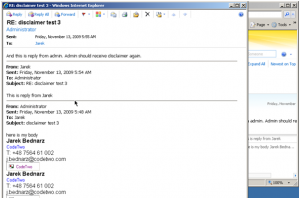 My configuration is for the rule to activate when the sender of the message is the Administrator. In the next step we define the action that will be taken i.e. “append disclaimer…”. 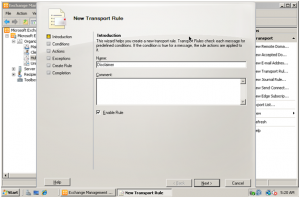 This is the only rule available in Exchange Server 2010, whose job is similar to the functionality of CodeTwo Exchange Rules. The options for composing footers in the built-in editor in Exchange leave much to be desired. First of all, the HTML code must be entered manually, let alone finger-typing of Active Directory placeholders (such as First name, Last name, Phone etc.). In order to built a footer with AD fields you would need to first find a list of available AD placeholders in the Internet. In order to build the disclaimer template we used Expression Web and tried to make it look similar to the one inserted to our email by CodeTwo Exchange Rules. Then we copied and pasted the code into the [sic!] 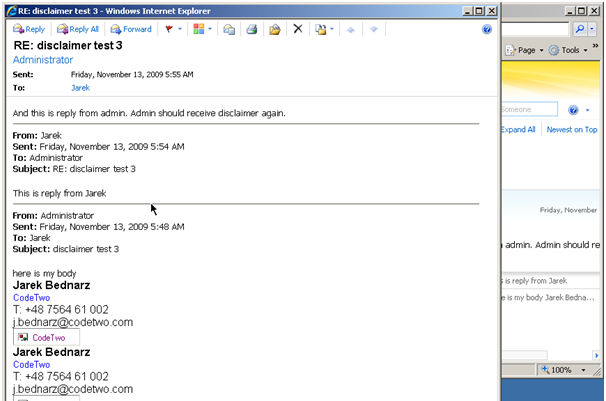 editor built into Exchange 2010. 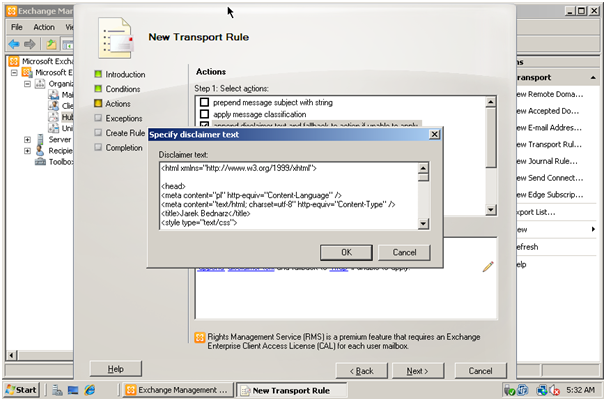 You will find the HTML code displayed in the rule window completely unreadable. The last step involved configuring the exceptions and finally we were off to approve the rule settings by sending a command to power shell. Let’s now run a few basic tests. First and foremost, we found it impossible to make the program add our company logo to emails. In HTML code it was clearly stated that the logo file is available through ‘file’ protocol (not mentioning it was the code generated by Expression Web). However, the program was not capable of reading it. We searched the Event log to find nothing. See below how the final footer looks for the recipient. Generally, it looks good but the image is missing. Then we tried replying to this email to the Administrator, and then again replying as the Administrator to see where the signature will be inserted in a series of emails. Just as we had suspected it was incorrectly placed at the very bottom of the message exchange, which makes the built-in disclaimer system in exchange unfit to be used for adding signatures that will naturally be placed just under the last reply text. As you can see below, multiple signature clumsily build up at the bottom of the history of correspondence. You cannot really expect a revolutionary change in the way the management of personal signatures and company disclaimers is executed in the new Exchange Server 2010. The conclusion is that the administrators of Exchange 2010 will need to continue using third party tools to have professional signatures, disclaimers and branding in their email, not mentioning hassle-free management. you go ahead and waste hours/days on creating signatues in Exchange 2010. Then find out that it fails big time on inserting reply signatures completely at the bottom of the email! What a joke! CodeTwo is reasonably priced and works great. What a surprise – a company website saying that we need to keep using their product! 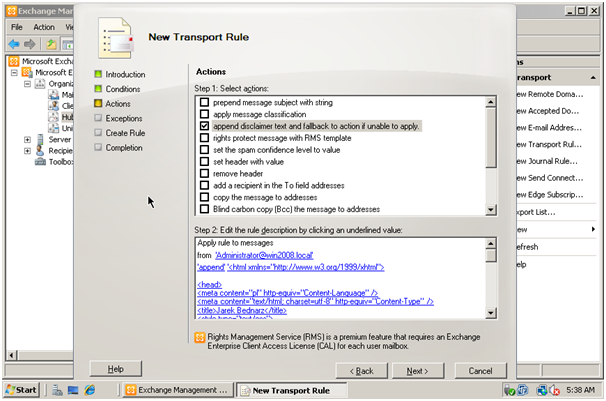 Now the release version of CodeTwo Exchange Rules 2010 is available. Visit Download Page to get the newest installer. The beta version will leave a watermark added to all signatures/disclaimers, like all our demo versions of CodeTwo Exchange Rules. There is no time limit in the demo mode. If you are interested in using a full version, please contact us via email. Does this beta version expire after some time?